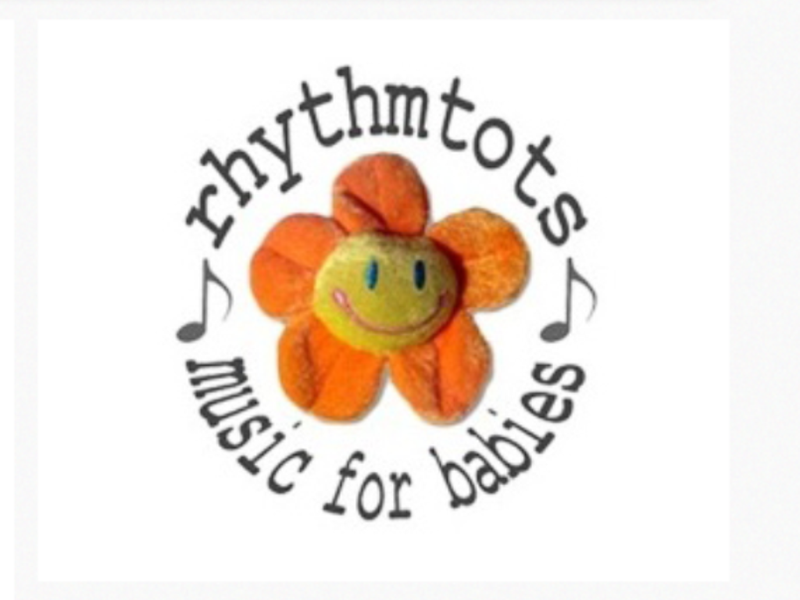 In 2006 my mother Mary set up ‘Rhythmtots’, a weekly music group for young children in her area. I became involved in helping out and by the time my sons Harry and Benjamin arrived respectively, it became a special time for bonding with my boys through music. 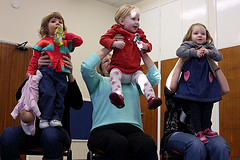 Mary’s classes attract tiny babies, big babies, toddlers, pre-schoolers, mums, dads and grandparents into music making, singing, dancing and listening. I have seen firsthand how quickly and naturally music can hold a child’s attention. It is known that music ignites all areas of learning for the very young; enhancing intellectual, language, physical, social and emotional development. Naturally, as parents we instinctively rock and use our voice to calm and soothe the child. Simply mimicking sounds, singing, or turning music on is a basic form of communication, expressing our love and joy for the child as well as engaging and interacting with them. 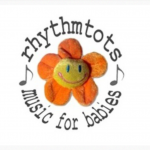 At Rhythmtots, the carefully chosen songs mean that singing and listening is a wonderful and relaxing way to learn language and it’s meaning at the earliest stages along with pictures,toys and props. Getting together is a social thing and there’s something magical about music that opens the senses to invite you to watch and listen. Or perhaps even choose to ignore! 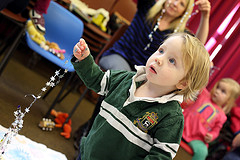 Children develop awareness of others and themselves by watching, singing and listening together while movement and playing music instruments helps build motor skills plus allowing them to practice self-expression. Rhythmtots gave me the tools and the inspiration to do the same thing for deaf babies and toddlers. They are absolutely no different from any babies that can naturally hear. Infants with different hearing levels below normal, in my opinion, are in fact even more need of aural and language stimulation. Nowadays with newborn screening we can find out whether our child has hearing loss hours after birth. In their first year deaf babies are often fitted with hearing aids/devices or cochlear implants to help them access sounds around them, although it does not cure hearing loss. Exposure to music means it gives them the chance to listen, play, develop language (both spoken and sign) and form ideas with what they are seeing, hearing and touching. Since 2010 I have been running weekly classes for deaf pre-school children and their parents in the Essex area. My mother and I share props, music, instruments and exchange ideas. Sometimes I play my flute to the little ones. I love the way that it makes them watch and keep very still. 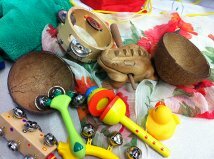 For deaf children at music group they have plenty of opportunities to explore the sounds of tambourines, drums in different sizes, clicking claves, beaters, hand chimes, guiros, rain-tubes and so on. We experiment with loudness and quietness, we sing and sign songs, see pictures, toys, books which link the words and signs, and do a lot of movement which shows the speed and beats of the music. I use animal puppets to mimic the sounds that they make; there are vibrant pom poms, colourful parachutes, pretend currant buns and counting rhymes, all aiding in the learning of words and language. I have about 200 songs in my playlist and I am especially fond of the ‘Singing Hands’ CD as the sounds of the words are clear, with a steady beat that isn’t too fast for the parent/child to sing and sign. Their singing voices are heard very clearly while the background accompaniment’s balance is just spot on, not too overpowering. Singing Hands uses makaton (signs that are borrowed from British Sign Language) and works together with well-known and new nursery rhymes. They have a DVD version and I always recommend my friends and parents buy a copy. My Deaf friends often ask me what I think is the best way to expose their little ones to music. My answer is simple: sing and sign! 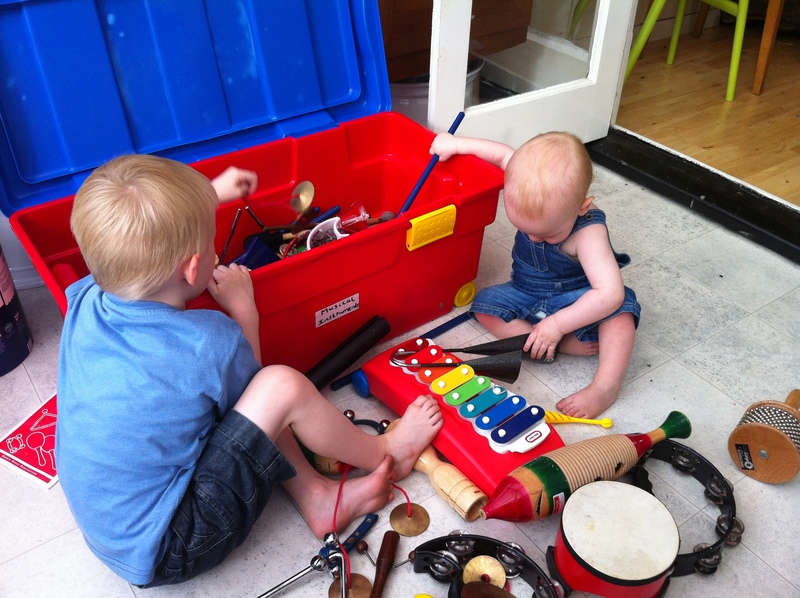 Let them play with pots, pans, spoons, cups, streamers, rocks – in fact, anything that will make a sound! 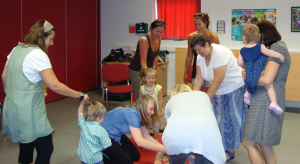 Make musical conversation with noises, repeating ideas and clues. In this digital age we are lucky to have plenty of access to nursery rhymes on YouTube, making them enjoyable for all. I like the fact there are many nursery rhymes with subtitles to facilitate singing and signing along. Music is a creative experience which involves expression of feelings. Children often do not have the words to express themselves and need positive ways to release their emotions. This is especially important for deaf children as often their language development is behind that of their peers with the natural advantage of hearing. Above all, it is a fun, relaxing, accessible activity with so many benefits. Hearing loss does not matter when music can so powerfully enhance and expand our other senses. http://www.youtube.com/user/SuperSimpleSongs – an example – plus many others.